IT’S been a busy 100 years but there’s a man in Lisnaskea who could tell you all about the past century, because he’s lived it. Yesterday, September 4th, James Lynch celebrated his 100th birthday, surrounded by his large family. This included his loyal and loving wife Maureen, a young 90-year-old compared to her husband, most of their 12 children, and their many grandchildren, though the exact number is to be confirmed. “I stopped counting after 25,” quipped James to his son Sean, the veteran Sinn Fein MLA, when he asked how many grandchildren he had. 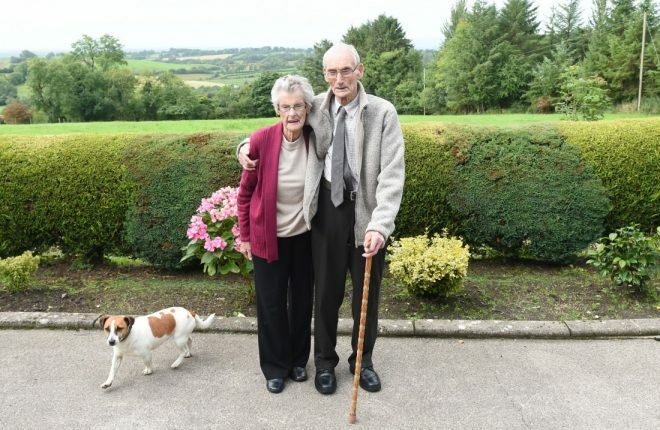 A hardworking man, James and Maureen raised their children on a farm in the townland of Baltreagh outside Lisnaskea. At the age of 65 he retired and built a new home, quickly taking to the life of a gardener. Sean said his dad would still get up at 8am to get out into the garden, and said he still helped out around the house, doing dishes and housework, as he’d always seen a man’s place in the home as well as on the land. Both James and Maureen as still keen readers too, and have always enjoyed traveling, particular to Donegal, and to family in the US. While James has been blessed with a large and loving family, things haven’t always been easy for the Lynches either. 2001 he lost his oldest grandson Gary in a a motorbike accident in the States. Both James and Maureen also had a hard time during the Troubles, and now appreciated peace all the more because of it.